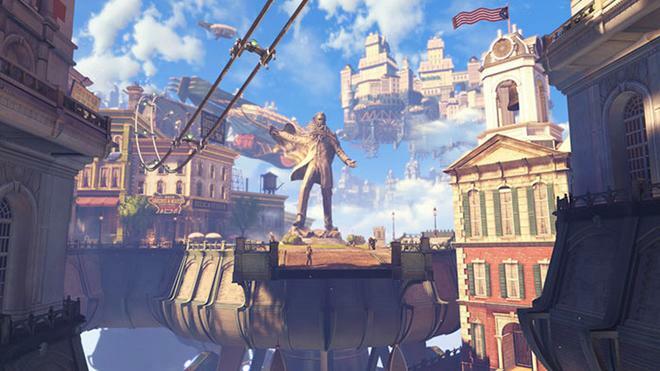 Mac gaming publisher Aspyr announced on Thursday that its port of "BioShock Infinite," the third game in the massively popular BioShock franchise, will be up for sale on Apple's Mac App Store, Steam and the company's own GameAgent on Aug. 29. The release date was posted in a Q&A on Aspyr's GameAgent blog, which also announced downloadable content availability, SteamPlay support, and special pre-order bonuses. While Apple's Mac App Store will have BioShock Infinite for sale on launch day, pre-orders are not being accepted due to store restrictions. Those who pre-order through GameAgent, however, get access to the "Columbia's Finest" DLC for free, as well as a digital coupon that takes 20 percent off the game's $59.95 price tag. SteamPlay is also available for versions of the first-person shooter not purchased through the Mac App Store, granting access to both the Mac and PC version of the game. Also supported is Steam's Season Pass, which gives subscribers access to three planned DLC packs, including Clash in the Clouds and the two-part campaign Burial at Sea. Apple's Mac platform has in the past been neglected by many game publishers, but that trend is slowly changing thanks to a number of factors, including the introduction of native support for Valve's Steam in 2010.